Folding | Mail-O-Matic Services Ltd.
Save time, money, and energy with Mail-O-Matic’s mail folding services. Properly folded inserts will fit into smaller envelopes which can help reduce your postage costs. Folding your mailing contents yourself by hand will be a drain on your employee resources which is why it is much more cost-effective to let our production staff do it for you. It may seem trivial, but folding is an extremely important part of your direct marketing campaign. 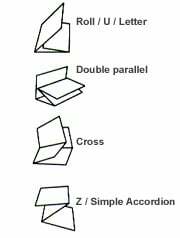 An incorrect fold could obscure important information or prevent your package from fitting into the proper envelope. Mail-O-Matic provides accurate and efficient document folding services in-house with our automated machines as well as by hand. A properly folded mail out looks clean and professional to your recipients, and It will be easier for them to organize and read your mail outs. They will take your package more seriously and are more likely to contact you. Your folding services at Mail-O-Matic are done exactly as you specify them.